A single mother of three children living in St Helena contacted the Club. Her middle child, Chloe, a nine year old, has autism, cerebral palsy, suffers from epilepsy and is non-verbal. To attend the Diamond Valley Special School her mother has had to carry her and she currently weighs 20 kilos. Her Occupational Therapist recommended that they get a DoBuggy to wheel her to and from school. A friend at the school suggested that the mother should contact a Rotary Club to see if they would help. 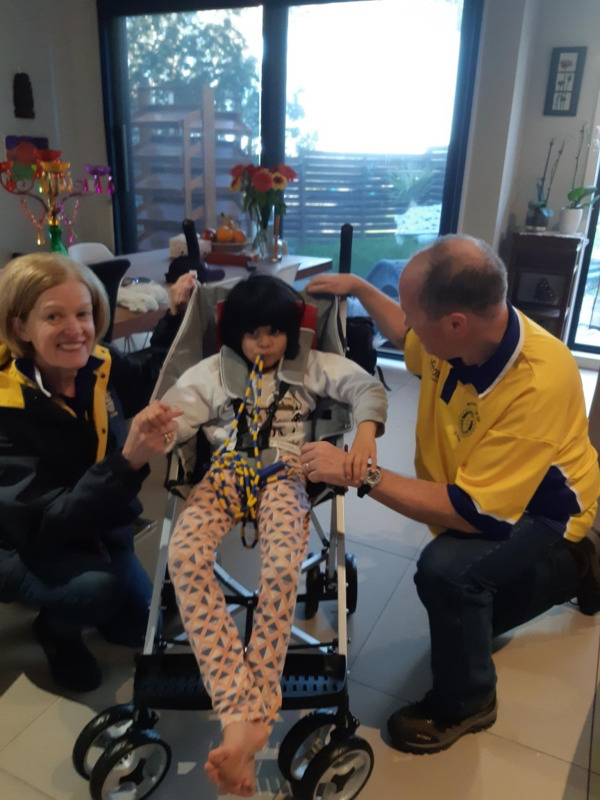 The request was taken up by our Community Service Director, Paul Kelly, and a DoBuggy obtained, it is capable of carrying a person of up to 60 kilos and so should last her until she is 16 or 17. The DoBuggy was delivered to Chloe and her mother by President Jill and Paul Kelly. When they bent down to talk to Chloe who was sitting in the DoBuggy she held their hands, which her mother said was most unusual as she did not normally make tactile actions.